With the summer holidays behind us and the new year raring to go, our Teen Advisory Board have been very busy reflecting on the past year and looking forward to some new and forthcoming novels. Find out what they’ve been reading below. The Guernsey Literary and Potato Peel Pie Society by Mary Ann Shaffer and Annie Barrows. I was in awe of the authors’ creativity in portraying a story entirely through letters. It was so cool reading one story non-chronologically, from multiple perspectives and all without quoted dialogue. I was impressed by how succinct the narrative was, even without conventional chapters or dialogue. One book I read and adored was All the Light We Cannot See by Anthony Doerr. It was absolutely exquisite—delicate and sensitive, yet still harsh and confronting. It is an absolute must-read, a necessity for anyone who cares about humanity, empathy, youth and love. A Thousand Perfect Notes by C.G. Drews. This book reads like a song—with both loud crescendos and minor chords. I read this book in a single sitting and was absolutely bawling by the end. It’s the sort of book you speed through to see what happens next but that you never want to end. The Wicked King by Holly Black. Following on from The Cruel Prince, this book is just as deliciously dark and twisted with the same wonderfully greedy characters. Circe by Madeline Miller. An epic tale that delves into the world of the Greek gods, with endless twists and constant changes of setting that keep the entire novel refreshing from start to finish. It’s a delightful read. 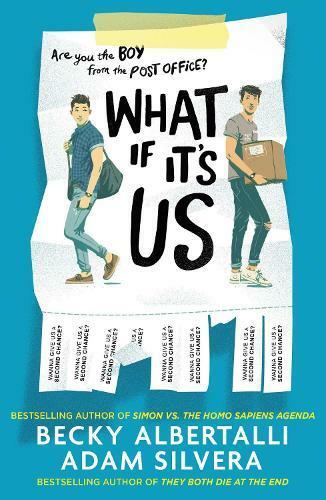 What If It’s Us by Becky Albertalli and Adam Silvera. A heart-warming romance from two amazing authors who seamlessly blend together their individual writing styles to create a beautiful story. Darkdawn (Nevernight Book 3) by Jay Kristoff. The end to my favourite trilogy of all time. And also Aurora Rising and Dev1at3 (Deviate), Kristoff’s other two books (the former with Amie Kaufman). I’m Kristoff trash. Lenny’s Book of Everything by Karen Foxlee. It was completely and utterly heart-wrenching, yet still so uplifting. The setting, the writing and the characters were just so unique and refreshing compared to all the other books I read last year. Plus, I think it perfectly encapsulates the innocence, curiosity and joy of childhood. Holding up the Universe by Jennifer Niven. I went into this book expecting the usual contemporary YA story, but got so much more. I couldn’t put it down and couldn’t get enough of it. Kingdom of Ash by Sarah J. Maas. An amazing conclusion to an amazing series. Maas has given fans a book that has been well worth the wait, and delivered an amazing conclusion to the protagonist’s story. Lenny’s Book of Everything. A heart-warming story about a brother and sister that takes you on an emotional rollercoaster and has some of the most beautiful writing of the past year. A Memory of Light by Robert Jordan & Brandon Sanderson. Alias Grace by Margaret Atwood. Beautifully structured and tightly written, it’s heartbreaking and exhilarating all at once. Fabulous Nobodies by Lee Tulloch. Blunt, honest and hilarious, it’s guaranteed to make you laugh out loud. Books are rarely this funny. Six of Crows by Leigh Bardugo. Again, it made me laugh, and it showed genuine relationships progressing beautifully. Also it has magic (and heists)! Jane Eyre by Charlotte Brontë. Old books aren’t always boring and full of pining! This was such a page-turner—fast-paced yet not shallow. Moving and very, very beautiful. Stone Mattress by Margaret Atwood. I would probably say the best book I read in 2018 was Wolf by Wolf by Ryan Graudin, which centres around Yael, a shape-shifting Jewish rebel who is charged with killing Hitler in a world where the Axis Powers won WWII. It’s a thrilling, engaging novel with a badass female lead and bounds of well-developed interesting places, situations and side characters (both good and bad!). This book rules. Of the many enjoyable books I read over summer, I would emphatically recommend The Silence of the Girls by Pat Barker, because who doesn’t love resilient women mixed with beautiful storytelling and Greek myths; and The Librarian of Auschwitz by Antonio Iturbe, an inspiring story about the power of words and hope in the face of struggle and oppression. I’m really looking forward to Aurora Rising by Amie Kaufman and Jay Kristoff. I was lucky enough to receive an ARC. I absolutely loved and devoured it, and I’m already itching to get my hands on book two. I’m also looking forward to finally getting around to reading Invictus and The Walled City both by Ryan Graudin, and The Loneliest Girl in the Universe by Lauren James.